The Wunderbag™ Micro Pre-filter is NOT just another vacuum bag filter. It captures particles down to .5 microns - that's incredibly close to a HEPA rated filter that captures particles down to .3 microns. Why is that important? Because the dust created by sanding, cutting and grinding materials like concrete, stone, fiberglass and drywall is extremely fine. The finest dust particles can go straight through typical wet dry vacuum. Watch the cloud of dust that's coughed out the exhaust port when you turn a typical wet dry vacuum on. That does NOT happen with a Dustless DustVac. The Wunderbag™ is an integral part of the patented filter system. Size counts. That’s why the DustVac uses the oversized proprietary Wunderbag™. It is capable of holding more than 80lbs. of dirt and debris even though the vacuum is designed to be emptied with 40 lbs. This ensures that at least 50% of the bag’s surface area is always free to support airflow. The Wunderbag™ has 50% more service area than the most popular uncertified HEPA retrofit filter. With shop vacuums that are designed to be filled to the brim, the surface area is consumed very quickly, restricting airflow. The DustVac also features a roomy 16 gallon canister with the interior designed to support higher airflow. The canisters of many traditional shop vacuums are either too small or not designed to support the high airflow required for dust control applications. The Wunderbag™ provides five extra layers of filtration in addition to the two provided by the primary and secondary filters. It also retains its strength when wet. 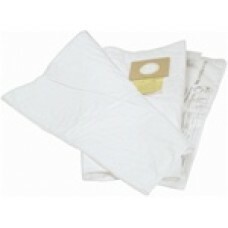 There is no other vacuum filter bag like it! Using the Wunderbag™r helps keep the primary and secondary filters clean, extending their life. The Wunderbag™ fits inside the main canister and cardboard connecting collar presses onto the inside of the import throat. A peal-and-stick adhesive flap is folded over the mouth of the cardboard connecting collar producing an air-tight seal that keeps dust from escaping when changing filter bags.